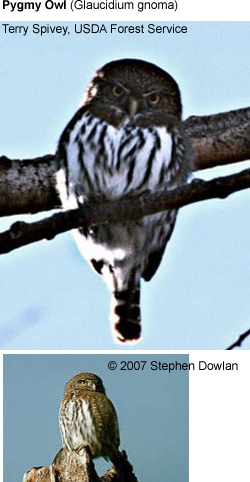 The Northern Pygmy Owl, Glaucidium gnoma, is a small owl. Adults are 16-18 cm in overall size. 2 color morphs occur -a gray and a rufous type. The owl has a round white spotted head, facial disc, upper breast, wings and tail, the latter quite long compared to other owls. Eyes and bill are yellow. The bird has 2 black nape spots on the back of its head, which look like eyes. The mid to lower breast is white with darker vertical streaking. Their breeding habitat is open to semiopen woodlands of foothills and mountains in western North America. They usually nest in a cavity in a tree, and will often use old woodpecker holes. The female lays 2-7 eggs. The Northern Pygmy Owl is essentially nonmigratory, but will move south and downslopes to avoid harsh winters. It may also move some to take advantage of food abundance. These birds wait on a perch and swoop down on prey; they may also catch insects in flight. They mainly eat small mammals and large insects, also small birds. Northern Pygmy Owls are aggressive predators, often taking prey species the same size or larger than itself. These owls are diurnal, and also active at dawn and dusk. Currently, most experts consider this bird a superspecies with the Mountain Pygmy Owl, but there is some discussion to split the two into different species. The birds differ slightly by call notes, and slightly by overall size. Some experts have already decided the birds as separate.